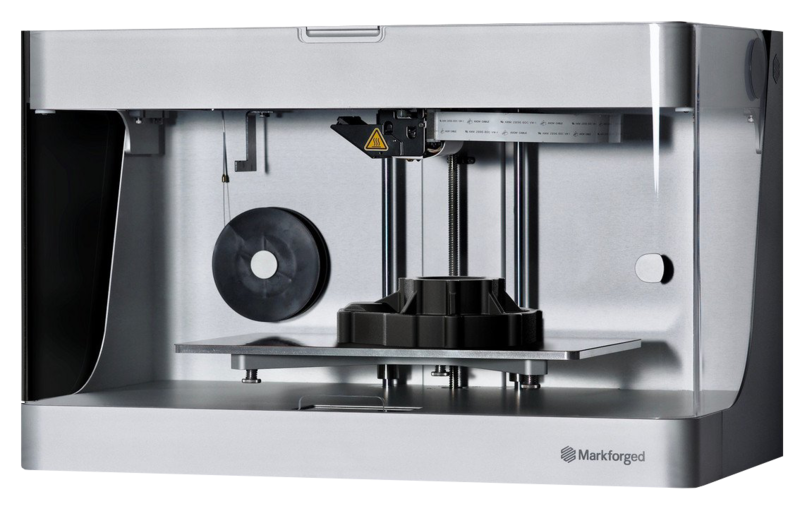 Markforged’s line of Desktop 3D printers have the DNA of their Industrial Series condensed into a package that fits right on your desktop, making them a winner of the Enterprise Printer of the Year award in 2017. These compact, powerful 3D printers are ideal for businesses and manufacturing environments with limited space, delivering parts strong enough to replace machined aluminum while saving time, money and effort. 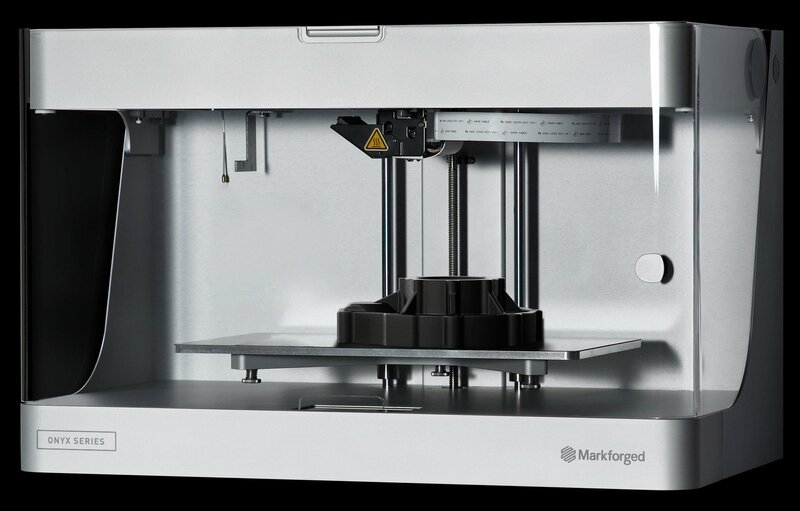 The Markforged Desktop 3D Printer Series are the only 3D printers on the market designed from the ground up – hardware, software, and materials – to uniquely create chopped carbon fiber parts with a beautiful surface finish, stiffness and temperature tolerance. 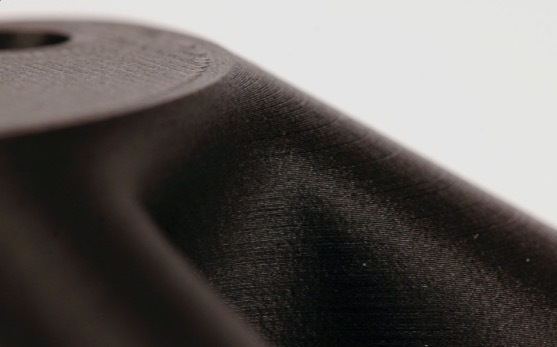 The Onyx material is at the core of all Markforged composite printers; a beautiful black filament made from combining tough nylon with micro-carbon reinforcement. Start with the Onyx One and create parts for a wide variety of applications using the acclaimed Onyx chopped carbon fiber filament. Step up to the Onyx Pro for the impressive strength that comes with adding continuous fiberglass for strong composite parts. 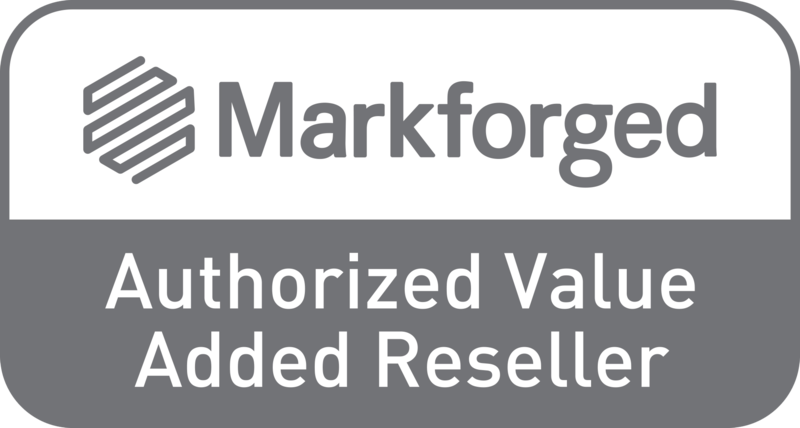 The Mark Two combines Markforged’s unique carbon fiber reinforcement with workhorse reliability for the strongest, most versatile parts in our portfolio. 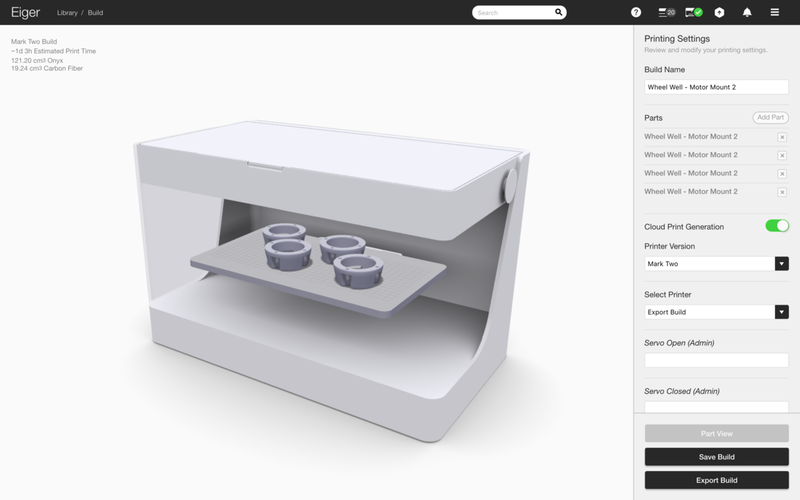 With your choice of reinforcement and plastics to suit any job, remove the time, hassle and design iterations and put your parts to use right off the printer with Markforged’s Desktop Series. 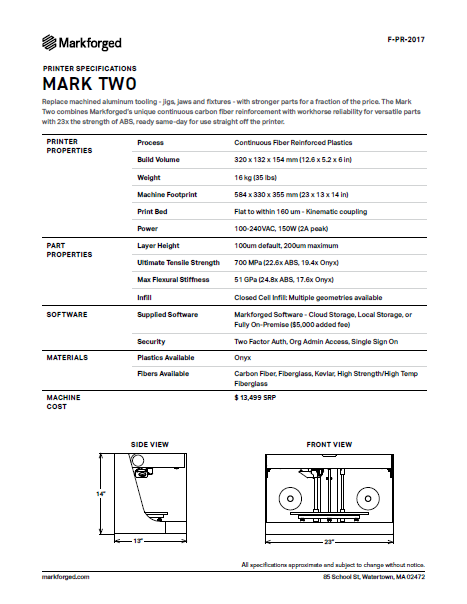 The Mark Two delivers industrial grade build quality and part strength in a desktop form-factor. 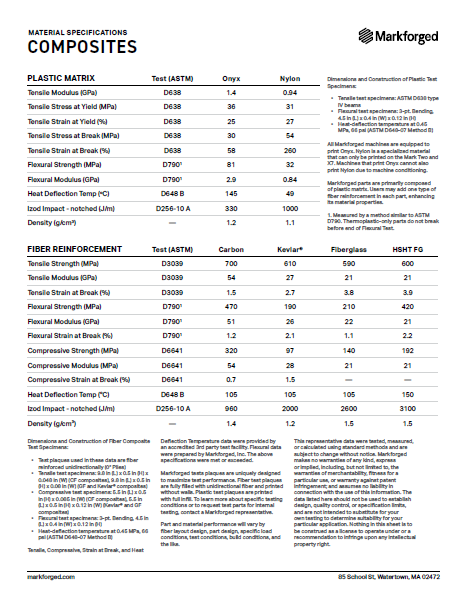 Print incredible strong continuous carbon fiber parts. 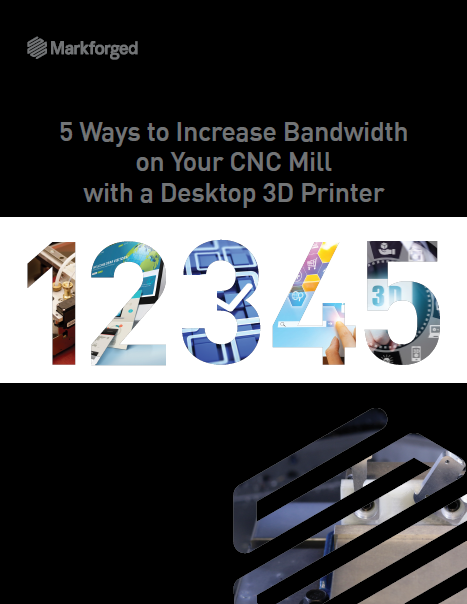 No other desktop 3D printer gives you the benefits of ever-improving functionality. 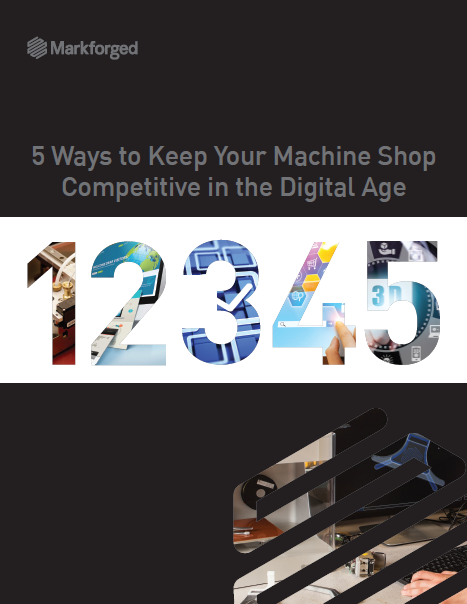 Whether it’s a hardware step up to the next level printer for stronger parts or more advanced capabilities in software, the same printer you purchased simply keeps improving over time. Printing improvements and innovations are delivered from our advanced cloud-based software, and each printer in our line can be upgraded to the next step up or to the Industrial Series. Need stronger and larger parts? Upgrade to an industrial series printer!